Genki: Tell us a little about your background? Roberto: I’m Italian, originally from the region known for Parma ham, Parmigiano reggiano, tortelli, Lambrusco, balsamic vinegar. I ran a forum back in 1994 about Japanese films/OAVs available in Italian language. The aim was to discover everything not commercially available for nostalgic purposes. Genki: What is the first anime you watched? Roberto: This is a difficult question. Like most of the Italian people I watched many because when I was young there were dozen of Japanese series on TV. I remember having watched hours of those series every single day! It was possibly Heidi, one of the first anime broadcast in Italy in 1978. Genki: Your book is about retro anime but how do you define retro anime and what was the first retro anime you watched? Roberto: I think it depends on who you’re asking this. What can be really considered “retro”? Let’s talk about Cat’s Eye (1983-1985). For some people this could be definitely considered “retro”, but not for me. So then, if you consider 1983 as a “retro” year, how would you describe something from 1960 or before? Let’s say my first “old” anime was the first Kimba series (made in 1965), but at the time of watching it was the year 1977, so I don’t know if this reply to your question! To me “retro” is definitely everything before my birth, so this book is really in topic! Genki: What inspired you to make this book? Was there a particular incident or film or creator that made you think you had to document the history of anime? Roberto: To be honest, I started this book as a personal list, because I found interesting to have a proper list of all those mostly unknown shorts. The problem was, the list was getting bigger and bigger, I didn’t expect to find so many titles, especially before the Second World War, so it was a real surprise and, at the same time it was a real challenge. I think that everything in the book had to be documented. Genki: You have a preview page on your website, is this going to be the format and page layout used on every page or will there be other styles? Roberto: The list layout will be basically the same, but I’m planning on adding some colour to the page’s background. Genki: What makes your book unique? Roberto: I could be wrong, but I believe that this book is possibly the first chronological list available in the world (well, at least in the western world) covering Japanese production from the beginning. Genki: How long did it take you to make the book? Roberto: I started it four years ago and I’m still working on it every moment I can but it’s mainly for some small fixes here and there rather than big changes. It was a very big challenge! Genki: How comprehensive is the list of films and what are the time periods you cover? Roberto: The first official title was made in 1917 and I planned to cover everything until 1969. I think this is the most comprehensive list you’ll ever find about the roots of Japanese animation! Genki: What sources did you use to research the book? Did you need the help of native Japanese speakers? Roberto: Several sources. Well, of course the internet helped me a lot. Or maybe not because information is scarce in some cases and it was really a pain to figure everything out and put all the pieces together. Then DVDs, contacts around the world, I also bought some Japanese books, but unfortunately I don’t know Japanese, so I needed the help of a friend of mine who runs the Kotatsu Japanese Animation Festival in Cardiff. I cannot thank her enough. Genki: How widely available is retro anime in Japan and the West and has the internet made a difference? Roberto: Everything made in black and white to me represents history and I think it’s very important to have a proper list of all the titles that built the Japanese animation industry which has become so important in the world. The National Film Center in Tokyo is still recovering and restoring shorts, but if you don’t live there it is unlikely you will have the chance to see them unless you travel. Fortunately, there are some DVDs printed, so it’s possible to track down something to buy on Japanese shops or auctions. Genki: How much retro anime has yet to be discovered? Roberto: Most of the titles are still in a reference list, with no evidence of an existing copy, sometimes even without evidence of the director’s name. It may be impossible to know exactly what and how much is missing. Genki: What was the most rewarding anime to research? Roberto: After a rough draft of the list (more or less 600 titles) every single title added later was a reward, because I knew I found another piece of information to improve the list and make it more comprehensive! Genki: Are there any foreign influences you explore such as Disney? Roberto: We cannot talk about animation without Disney. It isn’t be a secret that even Osamu Tezuka was deeply influenced by Disney. To me Walt Disney was the master, the man that influenced the entire world, not only Tezuka. He changed a lot the way that animation should be made but I didn’t put any detail about him in the book as I preferred to be more focused about Japanese animators. Genki: What do you think is the general perception of classic anime in the west and in Japan? Roberto: I think it depends heavily on the culture of the country. 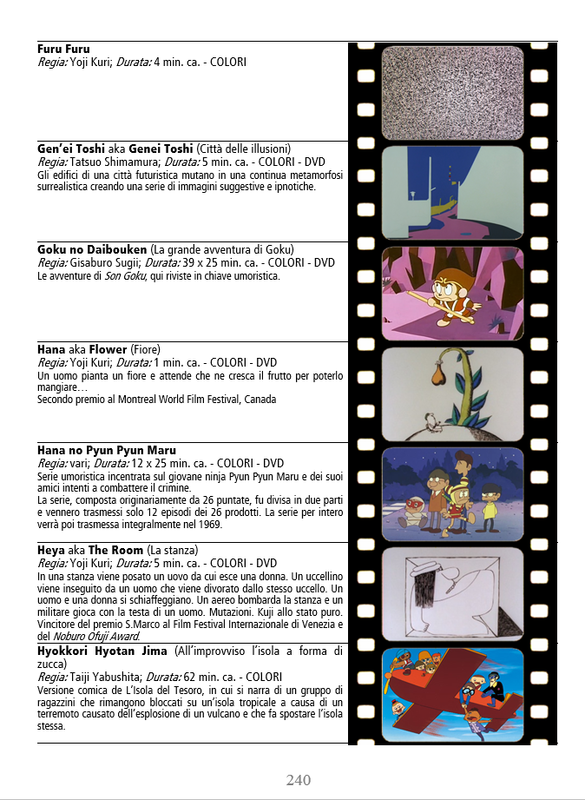 For example, in Italy we had the boom of Japanese animation in the eighties but there isn’t really a reason for this. I mean the first anime in Italy were screened like a test, to see if people liked a particular kind of product. In 1978, we had Heidi and Ufo Robot Grendizer. These appeal to different audiences but were both massive hits especially if you consider that they had their theme songs made exclusively for Italy so they also sold a lot of 7 inch vinyls for the Italian market. After that, it seems like every channel wanted to compete with the others, so try to imagine after a couple of years we had something like 20/25 different series to choose from. Every anime had its own Italian song which meant more vinyls, LPs toys, every kind of merchandise. Young people went crazy for Japanese cartoons. It was more or less the same in Europe, France, Spain and Germany. Genki: You plan to take this book to Kickstarter to raise money. Why do you think this is an ideal platform to get this book published and will you accept money from other sources such as Paypal? Roberto: I really hope so! Of course I can accept money from other sources, as long as this could help me to reach my goal and see finally my project finished! Genki: What sort of audience do you envision buying this book? Roberto: Apart from researchers, this book would be more interesting for forty and fifty years old, as I think the nature of the subject is related to the period you’re born. But I really hope there are some young guys and gals out there interested in this Japanese phenomenon that want to dig into this mysterious and rather obscure past! Genki: What is your target for Kickstarter? Roberto: I’m in contact with some printers and I’m still thinking about different merchandise that can be given to backers as rewards but I would like to focus mainly on the book itself, that’s the important thing. It will probably be a “no frills” campaign, but we’ll see. Genki: What people should expect to find inside the book? Roberto: Well, the chronological list is the main part of the book and it is spread over 170 pages. To make tracking down anime easier, information is compiled alphabetically and there is a directors’ index as well as a glossary for technical words. 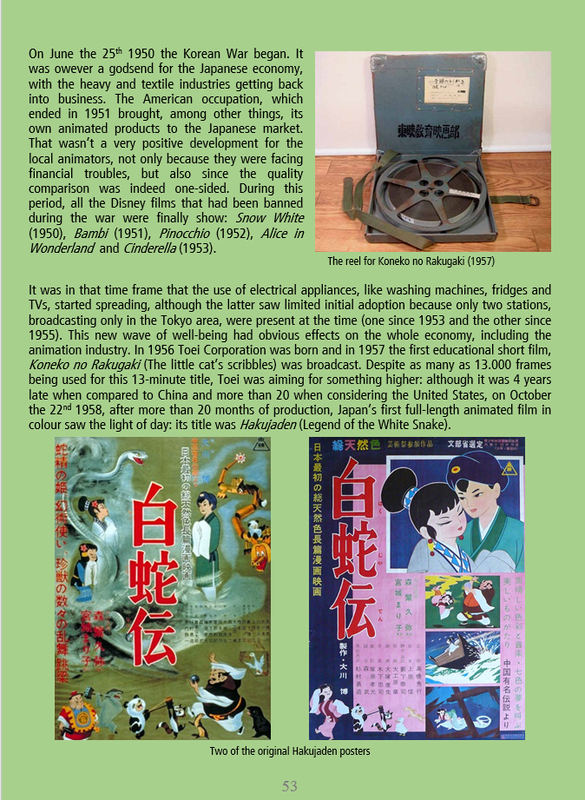 There are small chapters about origins of animation, how the animation is made, the main directors and a chapter about the availability of the anime on DVD. There will also be supplementary analysis and there is plenty of colour! Everything you need to know about the roots of Japanese animation in over 300 pages! Genki: Anything else you’d like to say to people to encourage them to support the book? Roberto: Don’t be fooled about the black and white animation, there’s plenty of good anime that needs to be watched. This book could be your one and only chance to have the most complete list made. It is useful for keeping track of those old films or series that you were wondering about and you won’t find this book in any shops, so grab this opportunity, because when it’s gone, it’s gone! You can find out more about the project on Roberto’s website.